Five members of the group attended the South Region RDA, Supra Regional Conference on Wednesday 19 April which was held at Newbury Race Course. The theme of the conference was Beyond Boundaries and there were some very inspiring speakers and a lovely vaulting display from Shacks Barn RDA Group. It certainly fitted the RDA motto - "it's what you can do that counts". 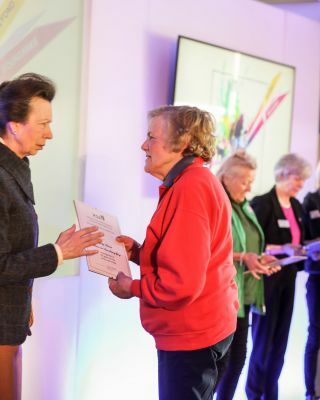 HRH The Princess Royal, President of RDA, was there and took time to present awards to long service RDA volunteers. Sally Merrick was presented with a 25 year award. Well done Sally!